1. In a large bowl, mix together the ginger, ketchup and Worcestershire sauce. Slash the chicken thighs with a small sharp knife then add to the bowl and mix until evenly coated, making sure the sauce goes into the slashes. 2. Grill for 25 minutes, turning once or twice until nicely browned and cooked through without any pink meat. 3. Meanwhile, mix together the cabbage, carrot, radishes and salad onions. Add the dressing and nigella seeds and toss together well. 4. 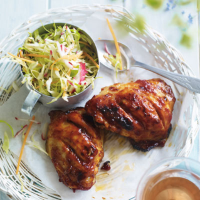 Serve the barbecue chicken with the simple slaw and flatbread. For a fruity dressing try Waitrose Mango & Chilli Dressing. If you’re pushed for time, why not try our ready-to-eat Waitrose British Roast Chicken Sticky Barbecue Drumsticks.